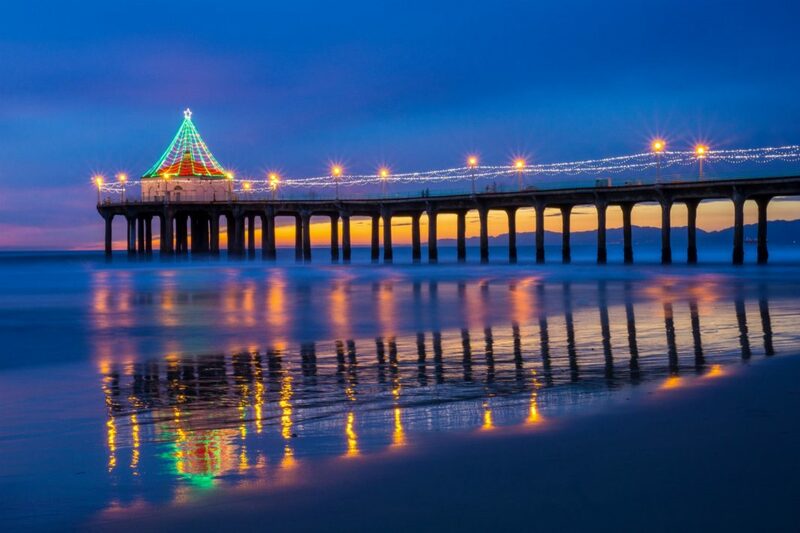 From a holiday light show downtown to holiday fireworks in Manhattan Beach, there’s a lot to do in L.A. this December. Here’s a guide to the best December events in and around L.A. If you’re looking to make your pup an Instagram influencer, Grace Chon (@thegracechon) can help. The pet photographer teaches you how to up your game at this iPhone-camera workshop, open to shutterbugs of all levels, at Wallis Annenberg PetSpace. Your models? PetSpace’s adoptable paw-lebrities. Cram all your holiday shopping into two days at the California Market Center, where more than 300 artisans hawk jewelry, leather wares, ceramics, enamel pins, and other goodies. With so many cool things up for grabs, there’s no way your brother, aunt Sally, or super-hard-to-shop-for niece will be disappointed. If one shopping smorgasbord isn’t enough, head to the DTLA gallery to peruse hand-crafted, locally made wares from the likes of ARTBOOK, Block Shop Textiles, and BZIPPY & Co. ceramics. If that weren’t enough, Hauser & Wirth’s on-site restaurant, Manuela, is dishing up delicious treats to keep your energy up, and you can even catch performances during the day, too. The rock-star authors of Eat Pray Love and Wild sit down for a candid chat about creativity, politics, and love at UCLA’s Royce Hall. Go for the inspiration, stay for your chance to ask them a question during the audience Q&A. With Oscar season around the corner, the Hammer Museum rolls out screenings of the year’s best movies, followed by interviews with the key players behind them (2017’s lineup featured Jordan Peele for Get Out and Greta Gerwig for Lady Bird). We’re not saying Lady Gaga will be there—but, hey, she might. Stuff your face and the coffers of the ACLU at this one-off dinner-meets-art event, which benefits the nonprofit org’s Immigrants’ Rights Project. Husband-and-wife chefs Alex Raij and Eder Montero of New York’s Michelin-starred La Vara are in the kitchen for this edition at the Standard downtown. If ice tubing down a 150-foot mountain sounds more fun than treacherous, then make tracks for the O.C. Fair & Event Center’s wintry wonderland. Stop into the Alpine Village—where fresh snow is blown in daily—or cruise an ice rink under the stars. Stay late for fireworks and animated light displays. Ring in 2019 The Lonely Island way: on a boat. Long Beach’s Queen Mary decks out its many decks in the style of a different decade (deckade?) on New Year’s Eve. Party into the wee hours with live music, fireworks, and food; you can even book a suite and stay the night. Next articleA Peek Inside This Is Los Angeles, Estevan’s Oriol’s Latest Photo Chronicle of L.A.